Celtic manager Ronny Deila believes Malmo will find it difficult to beat his side if the Scottish champions are at their best. Deila said: "We want to be in the Champions League. That's the goal, I've said that since coming to this club. "Now we have two games to reach it. The most important thing is to win and get a good result." The Norwegian believes Celtic have a better understanding and team spirit than at this stage a year ago, when his team were knocked out by play-off opponents Maribor. That defeat came a matter of weeks after Deila had taken over from Neil Lennon. 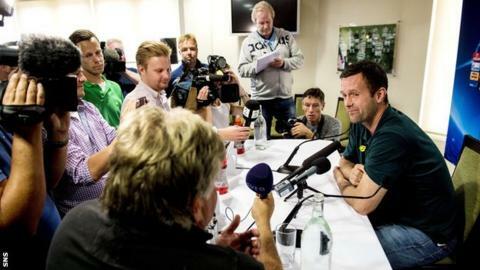 "I know the only thing I can do something about is the performance of the team, and I trust my team," said Deila. "I can't remember when we last lost a game and the team is in good shape, we have a lot of confidence. "We also know that to get a clean sheet is very important in European football. "We just have to be the best we can be and if we do that and don't succeed then we're not good enough. But I think if we are at our best, it's going to be tough for Malmo." Deila's countryman Jo Inge Berget could feature for Malmo. The forward had a brief loan spell at Celtic from Cardiff City during the early part of Deila's tenure, moving on after less than six months. "Hopefully, he will have a bad night tomorrow," joked Deila. "I have a good relationship with Jo Inge. I've known him for many years. "It was a tough time for him here, for me as well at the start here. I was struggling a lot with results and it's not easy to be a Norwegian then and he was one of the players brought in as well so he had a very tough time to get into Celtic." Deila was asked about a "Norway v Norway" contest between himself and Malmo manager Age Hareide, but replied: "It's more Scotland against Sweden."